A Russian cosmonaut and his NASA co-pilot, five months after riding out a dramatic launch abort last October, finally made it into orbit Thursday and, along with a NASA astronaut making her first flight, docked with the International Space Station six hours later to boost the lab’s crew back to six. Under a cloudy sky, the Soyuz booster roared to life and climbed away from the Baikonur Cosmodrome in Kazakhstan at 3:14:08 p.m. EDT (12:14 a.m. Friday local time), roughly the moment Earth’s rotation carried the launch pad — the same one used by Yuri Gagarin at the dawn of the Space Age — into the plane of the station’s orbit. 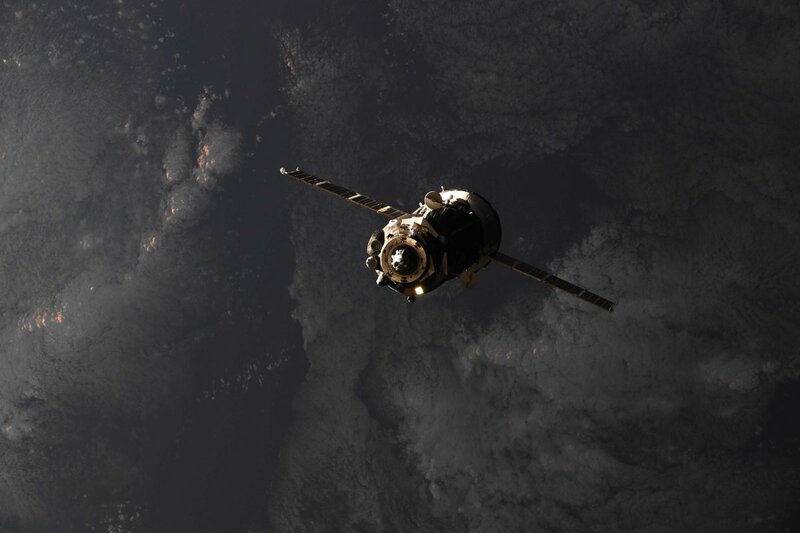 Using a fast-track rendezvous procedure, Soyuz MS-12/58S commander Alexey Ovchinin, left-seat flight engineer Tyler “Nick” Hague and astronaut Christina Koch caught up with the lab complex after a four-orbit chase, moving in for an automated docking at the Earth-facing Rassvet module at 9:01 p.m.
After waiting for residual motion to damp out, hooks and latches engaged to pull the ferry ship in for a so-called “hard mate” with the docking port. Hatches were expected to be opened about two hours later, after tests to verify an airtight seal and to equalize pressure between the two spacecraft. 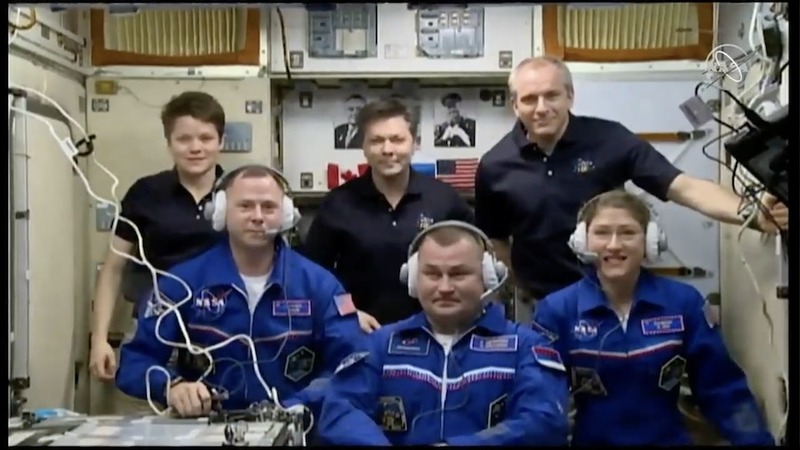 Awaiting the new crew’s arrival were station commander Oleg Kononenko, Canadian astronaut David Saint-Jacques and NASA flight engineer Anne McClain. They were launched to the outpost Dec. 3 and have had the station to themselves since Dec. 19 when an earlier Soyuz crew returned to Earth. The station normally is staffed by a crew of six, but the crew rotation schedule was thrown off last Oct. 11 when a Soyuz rocket carrying Ovchinin and Hague suffered a catastrophic malfunction two minutes after launch when one of four strap-on boosters failed to separate cleanly from the rocket’s central core stage. The Soyuz abort system automatically engaged, accelerating the crew capsule away from the failing rocket. Ovchinin and Hague reached an altitude of just above 50 miles before landing safely about 250 miles from the launch site. The problem with the normally reliable Soyuz booster was quickly corrected, clearing the way for Kononenko, Saint-Jacques and McClain to blast off Dec. 3. But downstream flights had to be rescheduled. The Soyuz MS-12/58S spacecraft launched Thursday originally was expected to take off in April with commander Oleg Skripochka, a United Arab Emirates guest cosmonaut and Koch, who was in training as the flight’s board engineer, or co-pilot. But in the wake of the abort, the flight was moved up and Ovchinin and Hague were assigned to join Koch with Hague taking over co-pilot role. In a pre-launch interview, Koch, an electrical engineer, rock climber and veteran Antarctic researcher, said she had no qualms about strapping into a Soyuz spacecraft and rocketing into space. The expanded six-member crew faces an unusually busy first few weeks together with three spacewalks planned around the end of the month to install new solar array batteries and carry out other upgrades and maintenance. 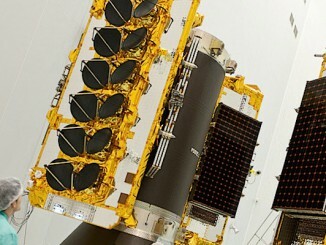 Hague and McClain will carry out the first battery swap-out excursion March 22 with McClain and Koch expected to follow suit seven days later. 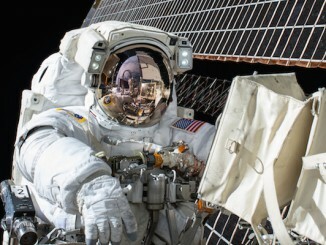 Hague and Saint-Jacques will conduct the third EVA on April 8. Cosmonaut Svetlana Savitskaya was the first woman to walk in space in 1984. Eleven American women followed in her footsteps, starting with astronaut Kathryn Sullivan during a shuttle flight in October 1984. McClain and Koch would be the thirteenth and fourteenth to float outside a spacecraft and the first all-female spacewalk team. NASA originally planned to install the new solar array batteries during two spacewalks last fall, but launch of the Japanese HTV-7 cargo ship carrying them to orbit was delayed and the EVAs were deferred until after Hague’s expected arrival last October. In the wake of the launch abort, the battery installation was delayed again. Along with the spacewalks, the station crew will carry out a full slate of scientific research and routine maintenance and unload six unpiloted cargo ships — two Russian Progress freighters, two SpaceX Dragon supply ships, a Northrup Grumman Cygnus cargo capsule and a Japanese HTV. Kononenko, Saint-Jacques and McClain are expected to return to Earth on June 25 to wrap up a 203-day mission. 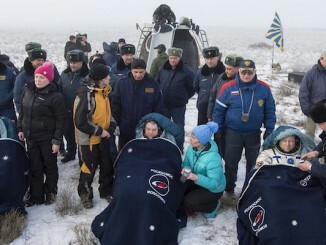 Ovchinin, Hague and Koch will have the station to themselves between then and July 6 when three fresh crew members will arrive: Soyuz MS-13/59S commander Alexander Skvortsov, NASA astronaut Drew Morgan and Italian Luca Parmitano, a veteran European Space Agency astronaut. That flight had been the last Russian mission contracted to carry U.S. astronauts as NASA transitions to commercial crew ships being built by SpaceX and Boeing. SpaceX launched its Crew Dragon spacecraft on an unpiloted test flight March 2 and may be ready to launch the first astronauts in the mid summer timeframe. Hague and Koch have trained for Crew Dragon and Boeing’s Starliner dockings, milestones Hague says are “a really big deal” for NASA, allowing the U.S. space agency to end its sole reliance on the Russian Soyuz for transportation to and from the space station. But NASA is hedging its bets. The agency is in the process of purchasing two additional Soyuz seats, one for use this fall and the other next spring, to make sure U.S. astronauts can reach the station if the commercial crew program runs into major delays. However it plays out, Ovchinin, Hague and Koch are scheduled to return to Earth on Oct. 3 to wrap up a 204-day mission.